Fire commander tells Arutz Sheva that poison found in Givat Mordechai apartment which killed two infants was at maximal levels. 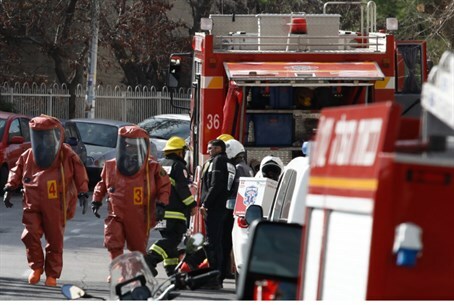 Commander Reshef Eli Basson, whose fire brigade unit arrived at the scene of a Jerusalem family's poisoning Wednesday, revealed to Arutz Sheva that the toxicity of poison at the Givat Mordechai home were of the highest levels on the spectrum. Basson stated that when the meter was brought out, the toxicity level astounded his team - to the point where "I wondered how the exterminator could have left his materials inside the apartment." "Jerusalem residents have suffered a difficult week," he continued. "I advise everyone to be careful." Basson is referring to this week's double tragedy: Wednesday's poisoning of a Givat Mordechai family, which killed a 2 year-old and a 4 year-old and left two older children hospitalized in serious condition, and Sunday's gas explosion in Gilo, which killed a young couple and their infant son. Wednesday's tragedy occurred after an exterminator left highly toxic materials - the same agents used in Syria's chemical weapons - in the apartment's enclosed security room, also known as the "Mamad" or bomb shelter. Apparently, the security room's seal was less effective than the storage requirements for the chemical require, and the poison spread throughout the apartment over several days. The exterminator has been arrested and an investigation has been launched. The family's youngest children, ages 2 and 4, died from the poison Wednesday. The rest of the family has been recovering - albeit slowly - as no medication exists to treat the poison, according to hospital staff. It has also been released that the family visited a Terem medical center Tuesday after complaining of symptoms similar to a stomach virus from the poisoning. The family was told to take paracetamol and prescribed medication for morning sickness to take the next morning.